If your home has become too small and the dimensions of your bathroom limit your actions, dare to change your perspective with the Victoria-N collection. You will not only make the most of every centimetre by adding a third drawer in the Family version, but you will be able to double the furniture unit and have 6 drawers and a length of 1200 mm where everything will fit. 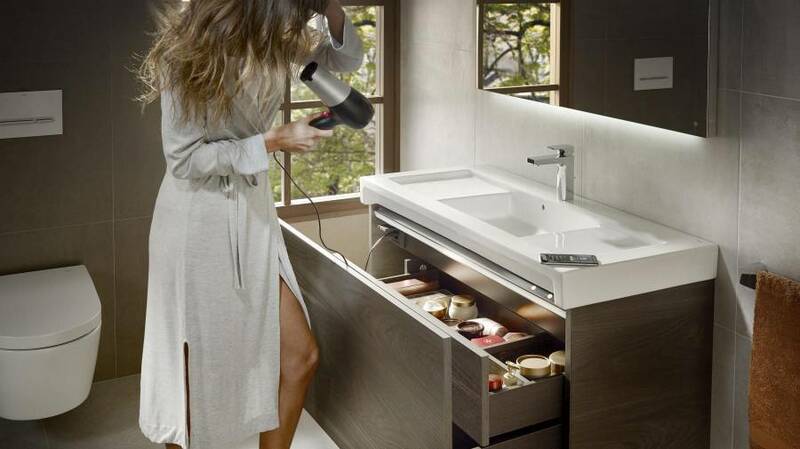 Thanks to its soft-close system, the drawers close softly, preventing wear and tear despite the intensive use of the furniture unit by a large family. 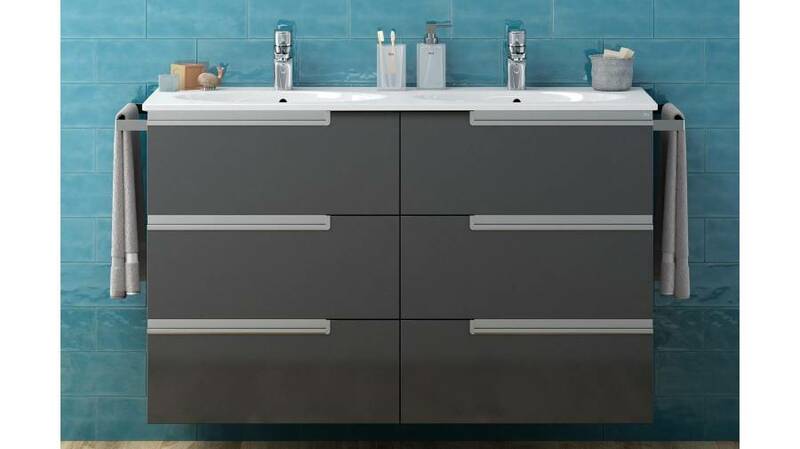 Because large bathroom furniture does not have to compromise on design, you will find Victoria-N in different finishes: Gloss White, Wenge, Anthracite Grey and Oak. 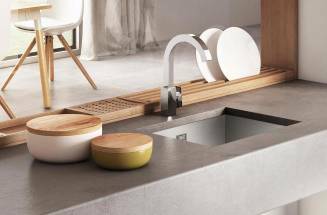 And to increase its usefulness, you have the option of attaching a towel rail to its side, achieving a more functional integration. Looks can be deceiving and with the Prisma collection the storage capacity goes far beyond what you see with the naked eye. The multiple possible combinations will not only allow you to have functional solutions with 1 or 2 drawers, but you will also be able to double the furniture unit and increase even more the storage capacity with up to 4 drawers and a length of 1200 mm. 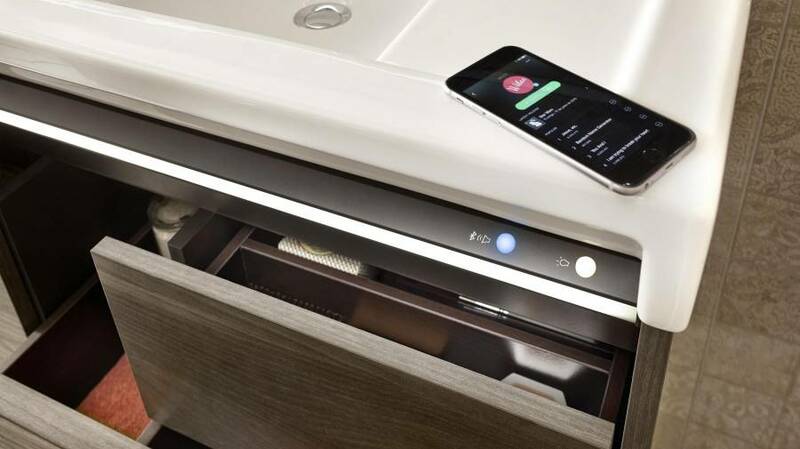 The versatility of Prisma is accentuated by the concealed drawer included in all its versions, so that you can store smaller objects in a safe place. 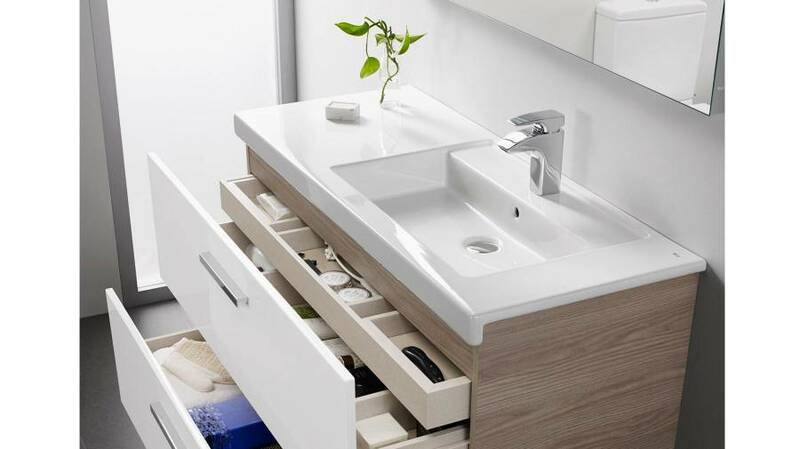 A compartment with no cut-outs thanks to the space saving siphon, which provides a usable area in all drawers, even in the one closer to the basin. 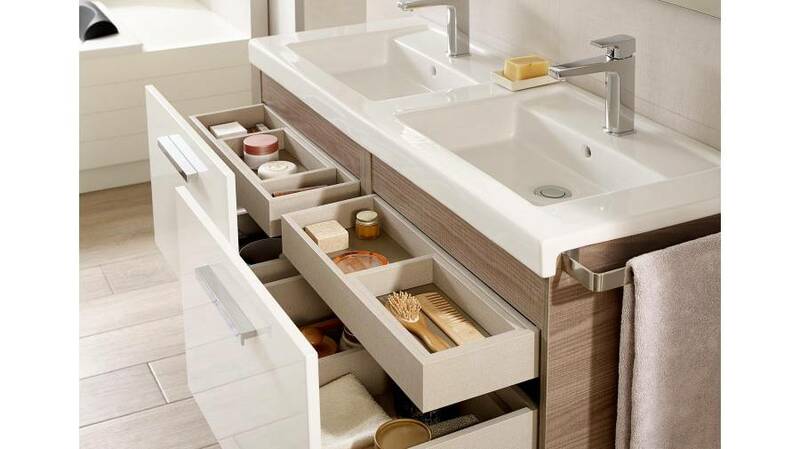 Moreover, as the drawers can be fully extracted, you can have everything at your fingertips and organise the content inside by moving the dividers according to your preferences. 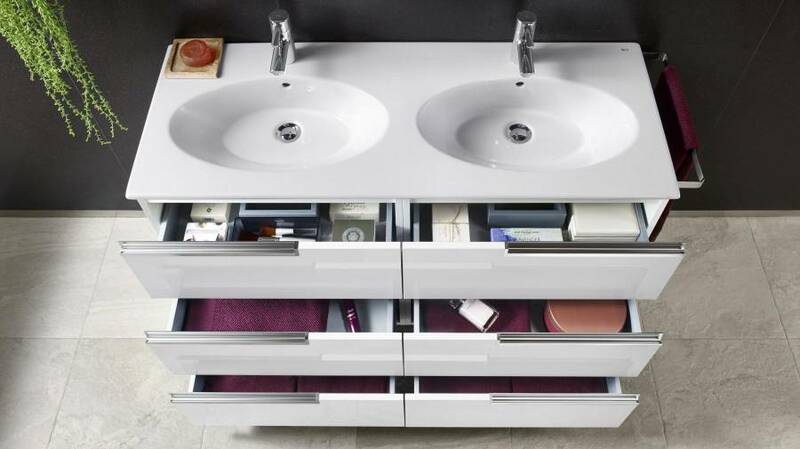 In Lacquered Gloss White, Ash, Anthracite Grey or the combination of the White front and Ash on the side, the high-capacity Prisma furniture units provide an additional surface to place the toiletries you use more often, if you choose the option of the asymmetrical basin with integrated shelf. If you need an extraordinary performance, then the smart Stratum-N furniture unit is your partner. 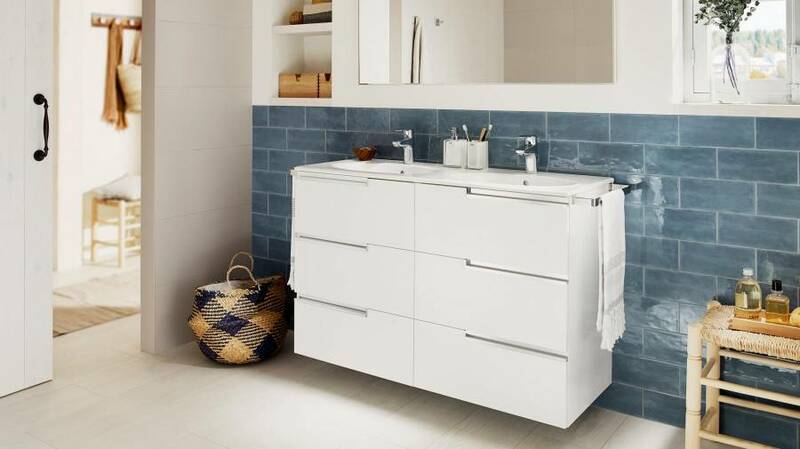 Its storage capacity will seem endless due to its larger than usual dimensions: no other bathroom furniture features a depth of 500 mm combined with an exceptional length of up to 1300 mm, so that absolutely everything finds its right place. 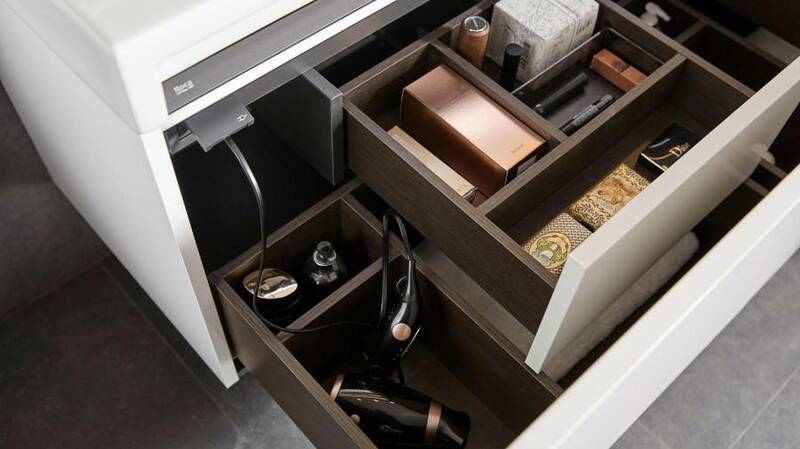 In 1 or 2 drawer configurations, Stratum-N goes further and brings you up to two additional concealed drawers where you can store medium-sized objects. As these internal compartments are smaller and do not take the entire length of the furniture unit, they will allow you to store objects in the main drawers that take up the entire height of the unit, playing with proportions to safeguard essentials with different heights. You can choose two different finishes, Gloss White and Yosemite, so that it perfectly fits into the style of your bathroom. 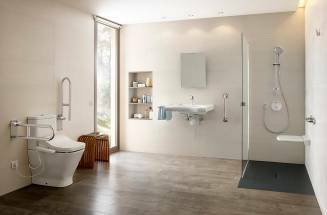 Finally, Stratum-N provides an added touch of distinction with technology: Bluetooth speakers that will allow you to listen to music in the bathroom, integrated socket to have an additional power outlet and internal lighting to help you find your toiletries. 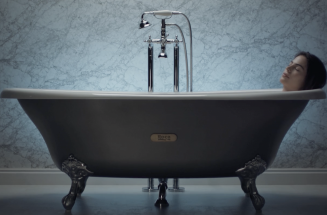 Are you ready to enjoy your bathroom experience even more?